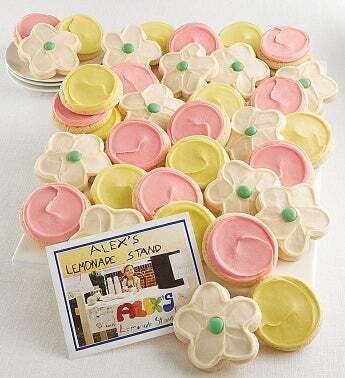 This cheerful assortment of 36 individually wrapped, buttercream frosted lemon burst, frosted strawberry sugar and flower cut-out cookies makes a wonderful treat for the office staff or your next celebration.15% of the Net Proceeds from the sale of this product will benefit Alex’s Lemonade Stand Foundation. A card announcing your generous gift will be included from each qualifying transaction. OU D.
Alex's Lemonade Stand Foundation emerged from the front yard lemonade stand of cancer patient Alexandra “Alex” Scott (1996-2004). In 2000, 4-year-old Alex announced that she wanted to hold a lemonade stand to raise money to help find a cure for all children with cancer. Since Alex held that first stand, the Foundation bearing her name has evolved into a national fundraising movement, complete with thousands of supporters across the country carrying on her legacy of hope. For more information about Alex’s Lemonade Stand Foundation, visit AlexsLemonade.org. This special offer cannot be combined with Promotion Codes or Reward Cards.